A Martian rock analyzed by NASA's rover Opportunity contains clays formed in non-acidic water, an environment potentially suitable for the chemistry of ancient life to brew. 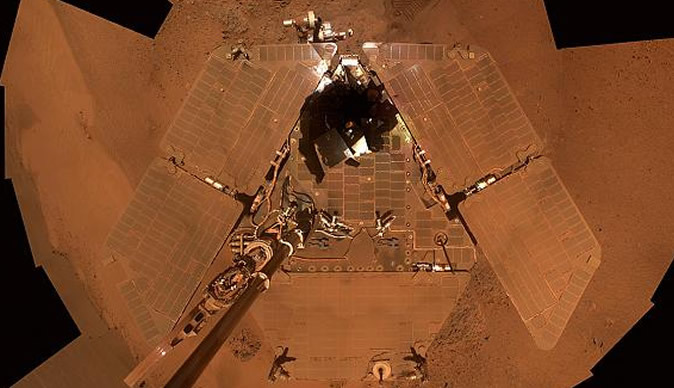 The solar-powered Opportunity landed on Mars in January 2004 for what was expected to be a 90-day mission to look for signs there was once water. It, and a twin rover, Spirit, which succumbed to the harsh Martian environment three years ago, had both found rocks altered by highly acidic water. While acid-loving microbes exist on Earth, scientists suspect the chemical building blocks for life need more neutral conditions to evolve into life. "The tough thing about an acid environment is that it's very, very hard, we believe, to get pre-biotic chemistry, the kind of chemistry that can lead to the origin of life," Cornell University's Steve Squyres, lead scientist for the Opportunity and Spirit missions, told reporters during a conference call on Friday. "What's exciting about this discovery is that it points to a neutral pH at a time very, very early in Martian history," he added. "What we have here is a very different chemistry. This is water you can drink," Squyres said. "This is the most powerful evidence for neutral (non-acidic) chemistry water that has been found by Opportunity," he added. Opportunity took three years to reach the rim of a large impact basin called Endeavour Crater, where it examined, among other objects, a small rock called Esperance. It took seven tries before Opportunity got itself positioned properly to scratch the rock's surface and see what lies beneath. Unlike NASA's follow-on Mars rover Curiosity, which landed on the opposite side of Mars in August, Opportunity has no drill or onboard chemistry lab to obtain and analyze samples. Instead, it uses its instruments to determine basic mineralogy. Esperance, scientists determined, contains aluminum-rich clays, a telltale sign that neutral water flowed through the rock. Likewise, Curiosity's first analysis of powder drilled from an ancient mudstone showed signs of neutral water, plus elements needed to support microbial life. Results from the rover's second sample analysis are pending. Opportunity now is making its way south along the Endeavour Crater rim toward an exposed stack of rock that may provide more clues about Mars' transition from a warm and wet world to the cold, dry, acidic desert that exists today. Scientists are hopeful Opportunity will make it there by Aug. 1, before the start of Martian winter in the southern hemisphere. "We've been on borrowed time for a while," said project manager John Callas, with NASA's Jet Propulsion Laboratory in Pasadena, California. "How long Opportunity lasts is anyone's guess."